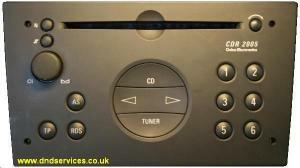 This radio is designed to fit Vauxhall vehicles that utilize a separate display on the dashboard. It cannot be used in other vehicles that do not have this separate display fitted. Please note that code entry is only possible with the ignition switched on, and in the order shown. If the display continually shows "SAFE" and a number less than "10" then the unit may be codelocked and will need to be left switched on up for up to two hours to reset before another code entry attempt is possible. If it does not reset after this time, or the display shows "SAFE" with no number to the left, then you are not following the correct code entry procedure, and your ignition has not been switched on. 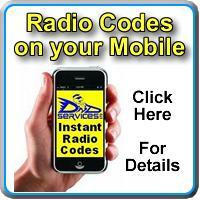 If all of your code entry attempts have been used up, the unit will need to be sent to us to be decoded and reset, details of which can be found below. Removal of the radio is fairly straightforward. The removal tools (2 sets required) are inserted into the four round holes at the edges of the fascia until a click is felt. The radio can then be withdrawn although the cage and leads will probably remain fixed to the car. There are two versions of Vauxhall vehicle displays, one with 8 Digits and one with 10 Digits. If you connect this stereo to the wrong display, code entry is possible, but the display will either freeze or disappear once the code has been entered. To reprogram, Turn off the Radio, Press and Hold Presets "3" & "5" at the same time, whilst switching the radio back on, and this will toggle between the two display modes.